IFC's Portlandia is one of my favorite shows. It was love at first sight. "Put A Bird On It" I was pretty much theirs for the taking. Now, comes the awesomeness of Baker Beth's cookie version. Seriously?! It's just making everything in life so swell. Every so often, my baking is a little conceptual, say, when I bake and style shortbread to look like Angelo's nesting ottomans or when I pay homage to his beloved Liz Lemon / Tina Fey. Completely ridiculous, I know. But they amuse me. And since we have to wait ... and wait ... and wait ... for a new season, why not nosh on some cookies in the meantime? I opted for a coffee cookie because Portland is a well-known coffee town. Which meant that chocolate had to come into play because Angelo loves coffee and chocolate together. Which made me want to dip the chocolate into something and hello? Portland? Granola! Angelo, for you, it's raisin-free. I had to put a bird on it. Silly? Yes. But seriously delicious, too. I think Fred and Carrie would approve. In a large bowl, cream butter, sugars, and espresso powder. Gradually beat in flour and salt. On a lightly floured surface (or between two sheets of parchment paper), roll the dough to between an 1/8- and 1/4-inch thickness. Cut with 2-inch cookie cutters. I used an oval cutter. I like ovals. Place 2 inches apart on ungreased baking sheets. Bake at 300ºF for 20-22 minutes or until set. (Adjust the baking time depending on how thick you roll the dough and on what size cutter you use. Touch the edge of a cookie to test doneness. It should be set.) Cool for five minutes on the baking sheet, then remove to wire racks to cool completely. Pour granola into a small bowl. Set aside. Beth Note: If the clumps are large, dump the cereal into a plastic bag and whack it into smaller pieces with the palm of your hand. You don't want to crush it into granola dust, just break it up in to pieces that are smaller and more uniform in size. Dump dark-chocolate chips into a small, microwave-safe bowl. Nuke for 30 seconds. Stir. Nuke for 15 seconds. Stir. Repeat as necessary until you have smooth, melted chocolate. Watch it closely. Chocolate burns easily. Dip half of a cookie into the chocolate (I dipped on an angle because I like the look), let the excess chocolate drip off, and then scrape off the bottom of the cookie on the edge of the bowl. Dip the chocolate-covered portion into the bowl of granola. 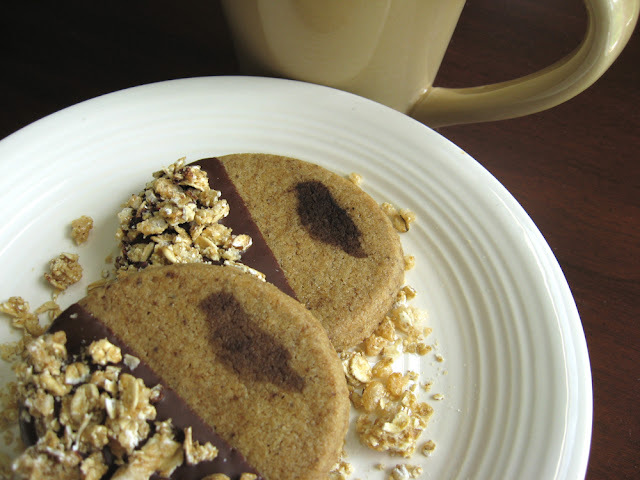 (I tried to not dip into the granola all the way so as to leave a bit of a chocolate reveal on the cookie.) Set the cookie back on the wire rack (put a sheet of waxed paper underneath it to catch drips) and allow chocolate to set. Repeat with remaining cookies. As for the bird, I found an image that I liked online, I shrank it on my computer, printed it out, and then used a craft blade to cut out the image to create a stencil. I positioned the stencil over the cookie, dipped a pastry brush into a bit of dark cocoa, tapped off the excess, and then stippled over the stencil, holding the brush vertically. If you actually bother with this kooky step, I recommend that you add the bird after you dip the cookies, lest you smudge it while dipping. Store cookies between layers of waxed paper in an airtight container. Yield: Depends on how thick you roll the dough and what size cutter you use, but around 3 dozen. sounds yummy, Baker Beth is awesome! Baker Beth appreciates the sentiment! She also finds that pretty much anything dipped in dark chocolate is worth eating.